A car bomb exploded Tuesday in central Baghdad outside the offices of the Patriotic Union of Kurdistan, which is located just outside the green zone headquarters of the U.S.-run coalition. At least three people were killed and 20 were injured, the military said. Ambulances raced to the scene and U.S. troops kept people back. Television footage showed debris and a charred wall of a building. The bomb was one of several blasts heard in the capital just after reports circulated that Ghazi Mashal Ajil al-Yawer, current head of the Iraqi Governing Council, had been selected as president of the interim government set to take power June 30. Another blast, followed by gunfire, sent a mushroom cloud 100 feet billowing into the dusty air hanging over the city. Coalition aircraft could be heard flying over Baghdad. Elsewhere, a car bomb exploded near the U.S. military base in northern Iraq on Tuesday. Eleven Iraqis were killed and 26 were wounded in the explosion, an Interior Ministry source told The Associated Press. Al-Yawer, the U.S. and Saudi-educated head of Iraq's Governing Council, was named president of the interim Iraqi government Tuesday, after the Americans' preferred candidate turned down the post the largely ceremonial post. Governing Council member Younadem Kana said the council agreed to dissolve immediately. But a senior U.S. official says the U.S.-led Coalition Provisional Authority remains sovereign until June 30. Two American soldiers died in Iraq on Monday as U.S. troops clashed with Shiite militiamen in fighting that appeared to mark the unraveling of a cease-fire called last week around the holy cities of Kufa and Najaf. Two other American soldiers died over the weekend in separate attacks, the U.S. military said. 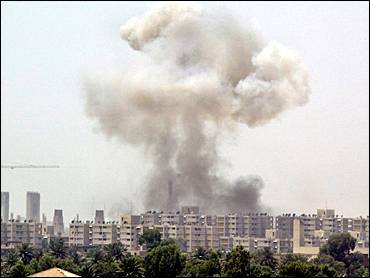 A car bomb exploded near U.S. coalition headquarters in Baghdad on Monday, killing four people and injuring 25. Australian Prime Minister John Howard on Tuesday denied that he had lied to the public or misled Parliament about when he first knew about the Iraqi prisoner abuse scandal and blamed civil servants for not telling him earlier. Facing resistance from key countries, President Bush is trying to line up support for a U.N. resolution seeking to set the stage for stability in Iraq. Mr. Bush called German Chancellor Gerhard Schroeder on Memorial Day, urging that the two nations work together on the U.S.- and British-backed resolution, the White House said. The U.S.-British resolution would authorize American-led international forces to take "all necessary measures" to maintain security and prevent terrorism, while no mention is made of the Iraqi army, except the need for training. Many other Security Council members have called the U.S.-British draft a good starting point, but suggested revisions. The approach spearheaded by China and supported by Germany, France and Russia would bolster the sovereign powers of the Iraqi interim government and extend far greater authority than the version introduced by Britain and the United States. The proposed revisions would give the new government control over the Iraqi army and police and require the multinational force to consult on military actions except for self-defense. Under the ideas backed by Germany and the other countries, the interim government that takes over on June 30 would have the right to decide whether foreign forces remain in the country and limit the multinational mandate to January 2005. The appointment of al-Yawer as president brings that government a step closer to reality. On Friday, the far more powerful post of prime minister went to Iyad Allawi, a U.S.-backed Shiite Muslim with military and CIA connections. Council members had angrily accused the American governor of Iraq, L. Paul Bremer, of trying to install as president Adnan Pachachi, a former foreign minister, over their opposition. The U.S. denied that. When Pachachi turned down the job, al-Yawer was installed. In Mosul, al-Yawer's hometown, crowds swept into the streets to celebrate the news, cheering and firing weapons in the air. American soldiers there appealed for calm. The blast in northern Iraq occurred around 9 a.m. outside the gates of the 1st Infantry Division's forward operating base, Summerall, in the town of Beiji, which is 155 miles north of Baghdad, press spokesman Capt. Bill Coppernoll said. He could not confirm the number of casualties. Beiji, population 60,000, is Iraq's third-largest city. It sits in the so-called "Sunni Triangle," a swath of land to the north and west of Baghdad mainly inhabited by Sunni Muslims. U.S. forces come under almost daily attacks in the area, where Saddam, himself a Sunni, enjoyed his strongest support. The PUK, the political party apparently targeted in one of Tuesday's Baghdad bombings, is seen as being close to the Americans. Under the leadership of Jalal Talabani, the party represented one of the main anti-Saddam forces on Iraqi soil after the Gulf War. Fighters from the party backed American forces in last year's invasion.